M. Tuttle & Associates: Principal Investigator, Martitia Tuttle. The primary focus of our research is paleoseismology, or the study of earthquakes as preserved in the geologic record. The primary focus of our research is paleoseismology, or the study of prehistoric earthquakes as preserved in the geologic record. The purpose of paleoseismology is to define the earthquake potential of fault zones or source areas. We also study other geologic hazards, review earthquake hazard assessments, provide geological expertise for archeological investigations, train earth scientists in paleoseismology, and develop educational materials about geosciences. Paleoseismology and neotectonics of North America and the Caribbean. Earthquake potential of the New Madrid seismic zone, central U.S.
Earthquake-induced liquefaction and ground failure. Tsunami hazards and characteristics of tsunami deposits. Application of remote-sensing techniques in paleoseismology. 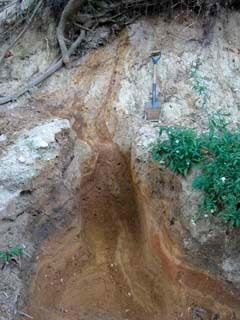 Paleoseismology study in Puerto Rico. Improving the earthquake chronology for the St. Louis region. Re-evaluation of earthquake potential and source in the vicinity of Newburyport, Massachusetts. Search for and study of sand blows resulting from prehistoric and historic New Madrid earthquakes. New--Educational web pages on paleoseismology and earthquake hazard of the New Madrid seismic zone.